You don't list your location (anywhere I've looked) and don't usually refer to it, so I'm kinda confused (and curious) where in the world you are. Hawaii? California? Hades? You know it's actually been similar weather here the last week or so too! I love the plaid though! i'm up in the northeast and it's still getting into the 80s up here (during the day), which is fine by me. 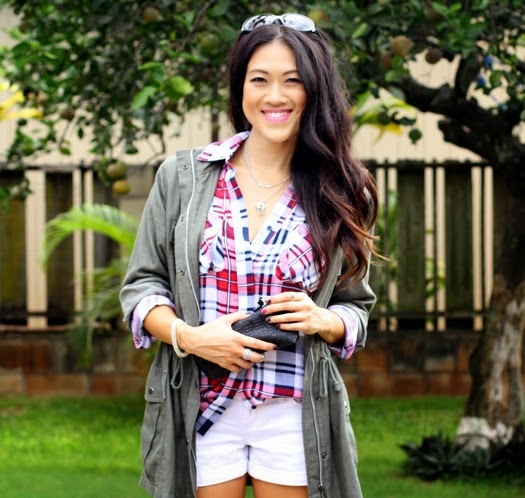 i feel like you're wearing all of the pieces i'm loving for fall -- plaid, utility jacket and brown booties! So cute! Love that top with the white shorts! Plaid is so perfect with that jacket! I would melt if it was 90 degrees wearing that. The utility jacket looks great with the plaid though! Another great look. I love the jacket and the combination with boots and bare legs is perfect.